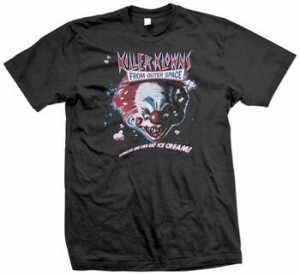 killer klowns from outer space movie t-shirt available now! Killer Klowns From Outer Space (link to movie info) was one of the original movies that took on “clowns” as a scary beings. Although the movie contained alien clowns, people who hate clowns often look back on the movie with a sort of fondness because of how “over the top” it went. If that describes you or someone you know, be sure to check out the officially licensed t-shirt from the movie that has been added to the ihateclowns store. Keep on the lookout for some new original anti-clown t-shirt designs in 2009! Comments Off on killer klowns from outer space movie t-shirt available now!